"Don't be scared of raw Brussels sprouts - they are delicious!" Whisk shallot, vinegar, oil, Dijon mustard, honey, salt, and pepper together in a small bowl. 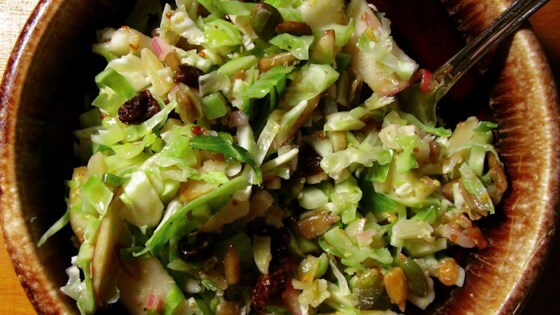 Place Brussels sprouts, apples, cranberries, almonds, sunflower seeds, and pumpkin seeds in a bowl; pour vinegar mixture over and toss to combine. Chop, chop for great health and flavor! Very tasty. I also make it with shredded cabbage. Loved this salad, even though I dislike Brussel sprouts. Try it you'll like it too. We loved this recipe. We had the leftovers the next day and the salad was still just as good as the day before when it was fresh. I used Bosch pears instead of apples and added diced broccoli stems. It had a nice mix of tart and sweet. Salad was delicious and everyone in our group loved it. I did make a bit more dressing and used about a pound of med-large sprouts to get the 6 cups. Will be making again soon!